"Focus, tenacity, self-analysis, and intensity. Don Miller conveys the essence of trading in such a compelling and down-to-earth mannerthe reader literally eats, sleeps, and breathes Don's moments of triumph and exhaustion. Don clearly nails the most pertinent points in this business: add to your position when you have a strong hand, fight to dig yourself out of the inevitable abyss, and don't trade when you are tired. This book is what professional trading is TRULY about!" Linda Raschke, President, LBRGroup, Inc.
"My career as a broker with some of the largest futures brokerages in the world has put me in a unique position to evaluate traders. I've been able to observe many of the best futures traders in the industry over the past twenty years. And what I can state with certainty is that Don Miller is one of, if not the, best futures traders I've seen. Great traders are able to recognize and adapt to changing market environments. They take their mistakes and use them to become better traders. Great traders possess the unique discipline to manage a losing trade as well as a winning one. These are the qualities I have witnessed Don Miller master. The fact that Don has agreed to share his experiences and insights makes this book an invaluable doctrine to all traders and investors alike." "I've had the good fortune of watching Don Miller trade profitably in front a live group of full-time traders over a two-day period of time. The methods Don teaches are solid, and more importantly, as you will see here in his book, they've been consistently successful. This book goes further than most trading books because you get to live with Don day by day, seeing both his actual trading along with his mind frame. If you want to learn from someone who has mastered day trading, and has successfully done so for years, then this book is must reading. Highly recommended!" "I have personally seen Don trade for several years, and he is candidly one of the best. 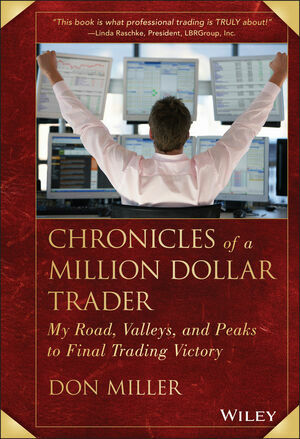 His book is enlightening and helpful in understanding the mindset of a successful trader." "A true story of sacrifice, hardship, and success. Don Miller shares his story to make $1 million in one year in real time, real trading records, and real life." Don Miller is an independent fund trader, educator, and industry advocate. Between 2004 and 2010, the total return of his privately traded fund exceeded 800 percent. In 2009, he created the popular "Jellie" trader training program through which he educates traders and raises money for various charities. He has spoken at numerous industry forums and has been widely published online and in print. Learn more at DonMillerBlog.com or DonMillerEducation.com.